Red snapper is the most popular fish in the snapper family; for both fishing and dining alike. Red snapper is an ultimate, carnivorous fish. They hide, adjacent to structure, and attack unsuspecting prey. The Gulf of Mexico is populated with structures, including thousands of oil rigs; artificial reefs and sunken vessels. This means world-class fishing for red snapper! They primarily travel in large schools, together with fish of similar size. Mostly, red snapper get bigger as water gets deeper. So, Captains Jerry voyage to where the larger, more aggressive red snapper abound. The captain might even take you to Big Snappy, his secret spot, where monster red snapper is found! For red snapper, heavy line and equipment are utilized. These fish fight strenuously, from two hundred or more feet deep. Remember to arrive rested and ready! 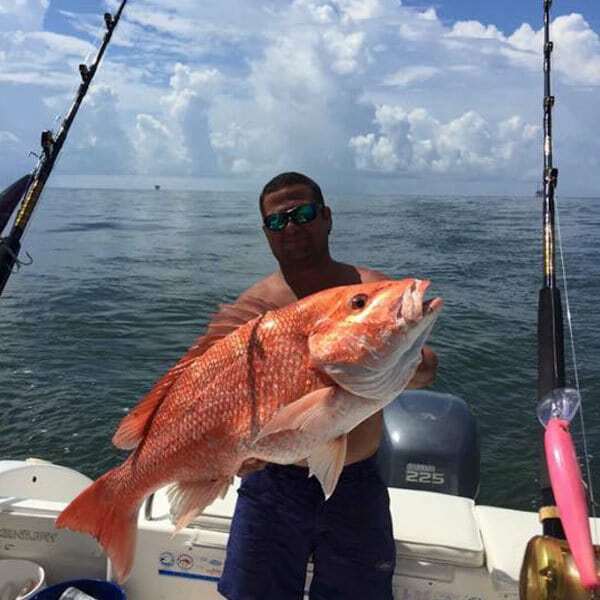 Red snapper fishing is heavily regulated; with limited seasons and quantity limits. Schedule your blue water offshore trip now, with Biloxi Bluewater Charters!